The Cavs Mobile App delivers an unrivaled interactive team experience by providing the most up-to-date scores, schedules, news, and stats. It's FREE for download at the Apple App Store and Google Play Store and is compatible on all Apple and Android smartphone and tablet devices. Fans who currently use the previous Cavs App will receive an update pushed directly to their device to download the latest version. Identify and Chat Directly With Your Member Rep! The WGU portal now allows you to talk directly to your rep via SMS messaging. Simply tap on “Chat with Your Rep” at the top of the portal to begin your discussion. The “My Perks” feature provides a breakdown of benefits available specifically to you based on your membership. The “My Experiences” feature allows you to select membership-level events that are available to you based on your membership. Rising Star’s and All Star’s can select up to 3 events they are interested in with Legend’s capable of selecting up to 5. 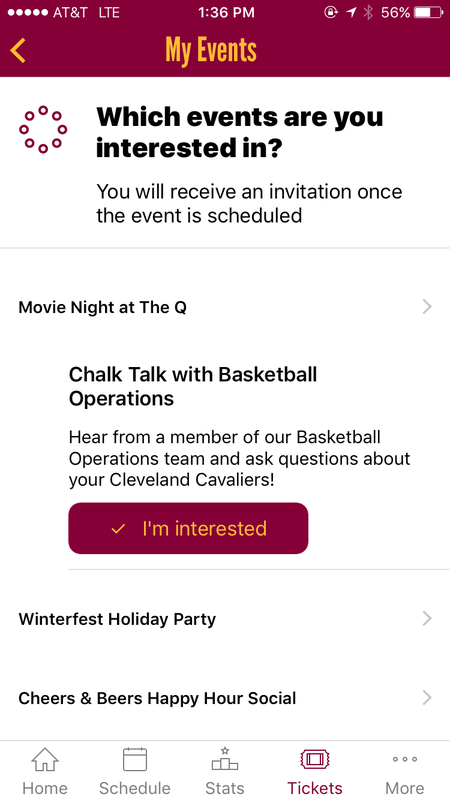 Selecting the “I’m Interested” button informs your rep and the Wine & Gold United service team that you have inquired/shown interest in the selected event. Your rep will then follow-up with you directly to provide event details and ultimately RSVP on your behalf. We’ve gone digital! 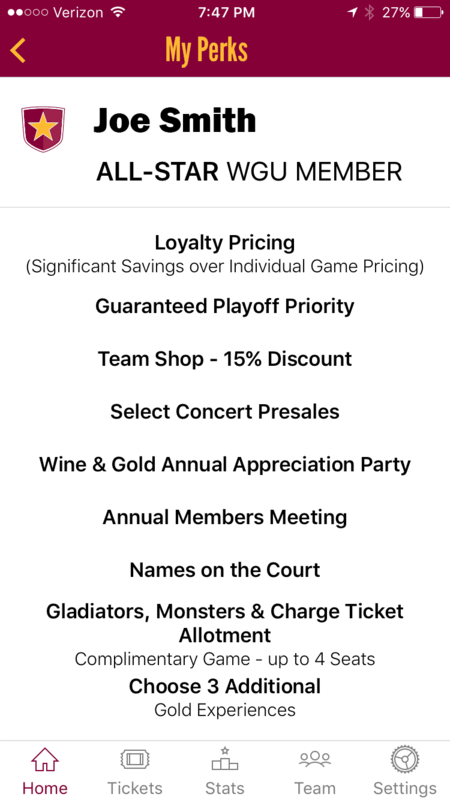 You can now access your Team Shop Membership Discount card directly through the WGU portal. 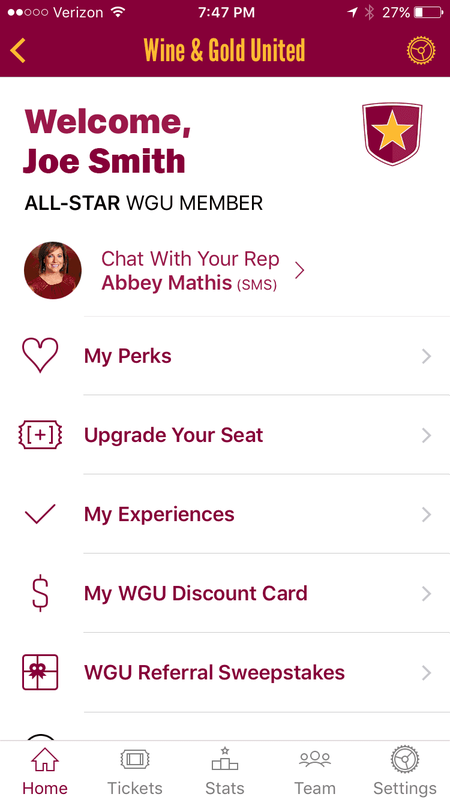 Simply tap on “WGU Discount Card” to access your discount card. You must use this card to receive your discount at the Cavaliers Team Shop. Your Team Shop discount also extends to cavaliersteamshop.com. In order to login and be recognized as a WGU member, you must create your Cavs Team Shop account using the same email address you have on file with your Flash Seats account. Your discount will be applied at checkout. Relive the most iconic play-by-play radio calls in Cleveland Cavaliers history from the voice of Joe Tait. Impress your friends and family when selecting from an audio archive of top plays - turning them into your own personal ringtone library. Dress your mobile phone in #CavsStyle with our latest mobile screensavers. Themes and options change throughout the season. Be sure to check back often for another great design to add to your collection. Ever wonder how the media keeps their pulse on everything Cavs? Here’s a little hint: it’s all in the game notes. You now have access to same facts and information about your Cavaliers and their opponents for every home game at The Q.